We went long on Gasolione (/RB) into the weekend as we expected OPEC to do SOMETHING to prop up Oil (/CL) at the $60 mark and we thought /RB Futures would make a good play into Thanksgiving regardless. We did, in fact, get noise over the weekend that our freinds the Saudis see the need to cut oil ouput by another 1Mb/d next year to maintain "price stability". 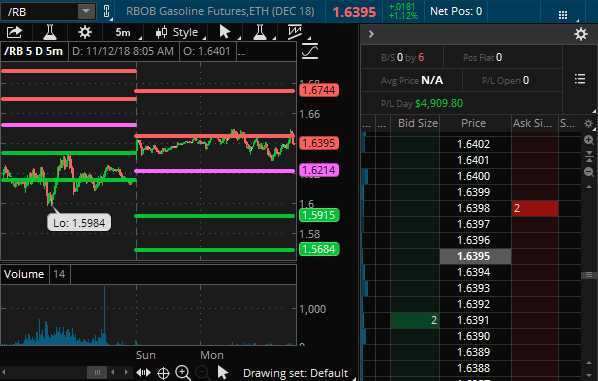 The next long attempt can be made over $1.65 on /RB or back at the $1.625 line and, of course, we'd love to give $1.60 another try but you have to use tight stops on Gasoline as the contracs pay OR LOSE $420 per penny of movement on each contract. When you get a strong move based on a quote – even from a very reliable source – you have to look to take quick profits because, as is the case with Gasoline – nothing has Fundamentally changed – just some Saudi Oil minister says (while oil is failing $60 and US inventories alone are climbing by 5Mb/week) that they "might" need to cut Global Production by 7Mb/week – a month from now – if the other OPEC members agree.